Previously, I gave my first impressions and the interior of the Prius c. In this review, we will delve into the nitty gritty features of the Entune and Navigation systems in the Prius c.
Before we start, the picture below shows some of the vehicle settings that can be changed via the touch screen. 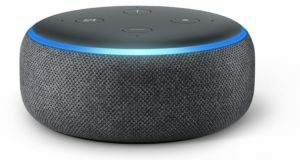 I’m sure we are only one or two versions away from being able to upload your own alarm sound to your car. 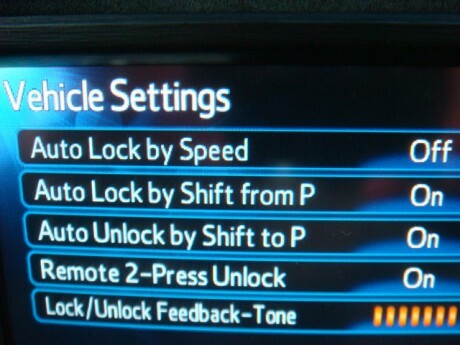 As you can see, you can set the car to lock the doors when you go from “Park” to “Drive.” It’s about time cars can be configured like your phone or TV. Entune is basically Toyota’s answer to Microsoft’s SYNC, which is to say, it’s an online connection and user interface for your car. To use it, you must first download the Entune app (iOS or Android) and have it running on your phone with the bluetooth active on your phone. According to the Engadget review of Entune, the Entune firmware simply is like a browser that shows what the app in your phone is feeding to the car via bluetooth. I don’t think this is true. It would be too slow for all the icons and images to be uploaded in real time. It’s possible that those static items are preloaded and just the positioning is controlled by the app on the phone. My Toyota dealer Eric told me that when updates come, the firmware in the Entune would have to be upgraded by Toyota. 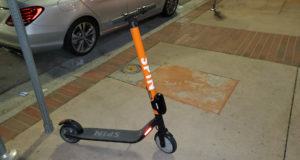 If true, I think only the raw data is being uploaded from the app to the car. Whatever the case, there are tons of features to checkout. 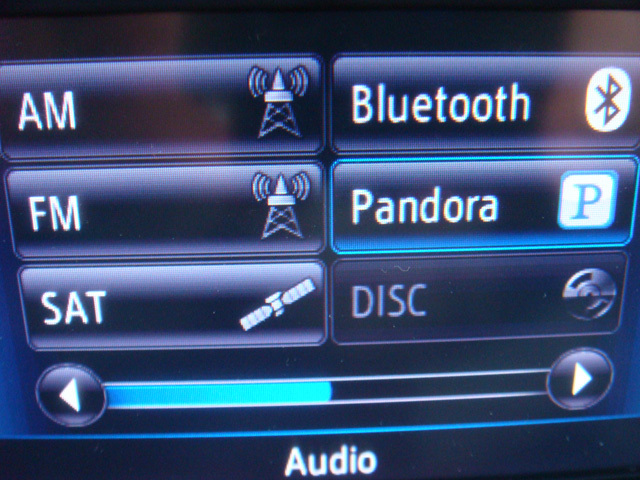 You can listen to regular radio stations or Satellite radio (subscription required) or even Pandora. The system will even allow you to play music stored on your phone. However, I noticed that sometimes there will be a glitch for about 50 to 100 milliseconds. This might be some type of garbage collection going on in Android on my phone, or it could be the Entune app running on the phone. 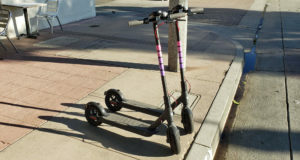 Whatever the reason, it’s too annoying to be used on a regular basis. Although I haven’t actually used it, you can even use a CD to listen to music. If you’re not familiar with CDs, it’s a physical plastic disc with music stored on it, much like a record. 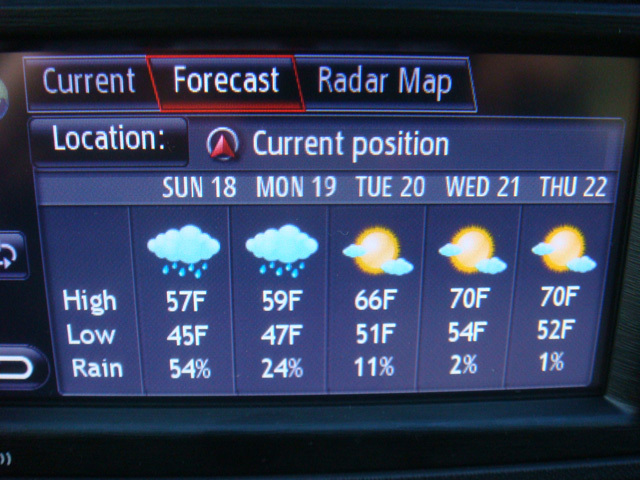 Just like your phone, one of the more mundane things you can do is bring up the weather information on the screen. 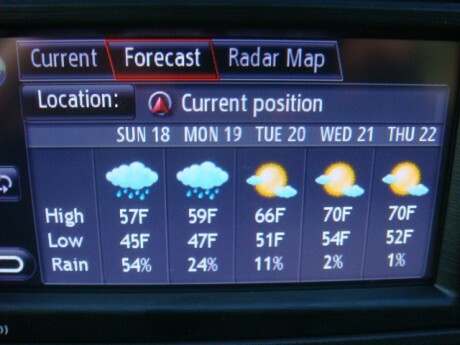 It will use your GPS to figure out where you are and display the forecast. If that’s not boring enough for you, try looking at your stock prices. Yes, what a great thing to be doing while driving. For more useful information, you have an interface to the Microsoft Bing search engine. It works pretty much like you are on your computer searching places. Unfortunately, the touch screen is old school and there is no swiping. To scroll the screen, you have to touch the up arrow or down arrow icons. If this came out in the 80’s, I would have been astonished at it’s advanced technology. After using the iPad, the user interface looks and feels very outdated. I expected a game of “Snake” or “Pong” to pop up on the screen. 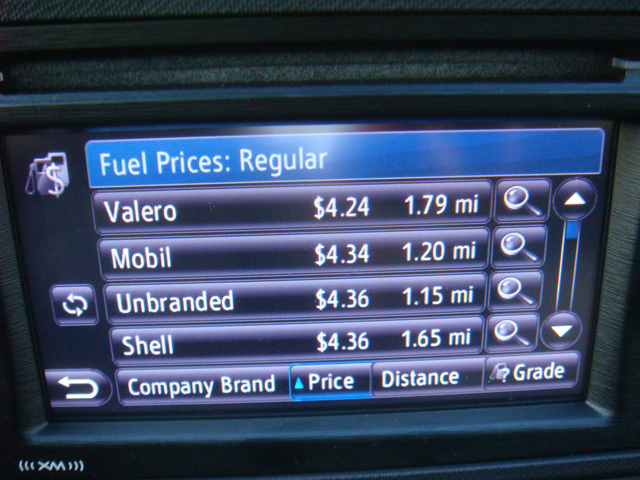 Since this is in a Hybrid car, it’s only natural that there is a way to get a list of close gas stations and their fuel prices. This is a nice touch. There is also a feature that allows you to enter the fuel price that you used last and the top display will show you how much money you are saving every time you drive your car. I guess they want to remind you why you bought a Hybrid. Another really great feature that I used to use on my phone is the freeway conditions being reported in real time. 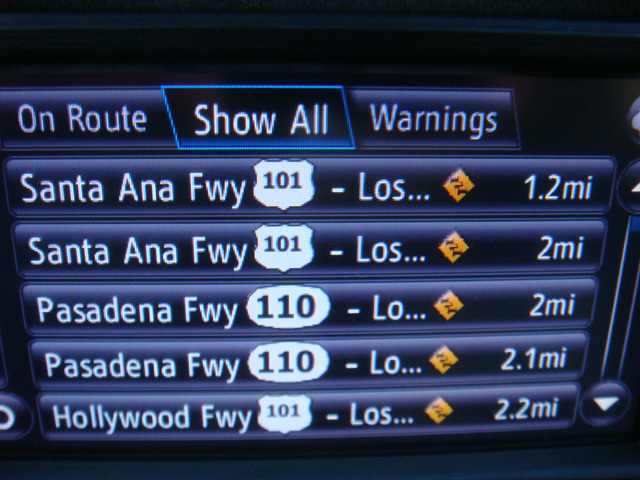 This information can be viewed in a list, or as you are using the Navigation system, you will see tiny icons showing where the traffic is located. 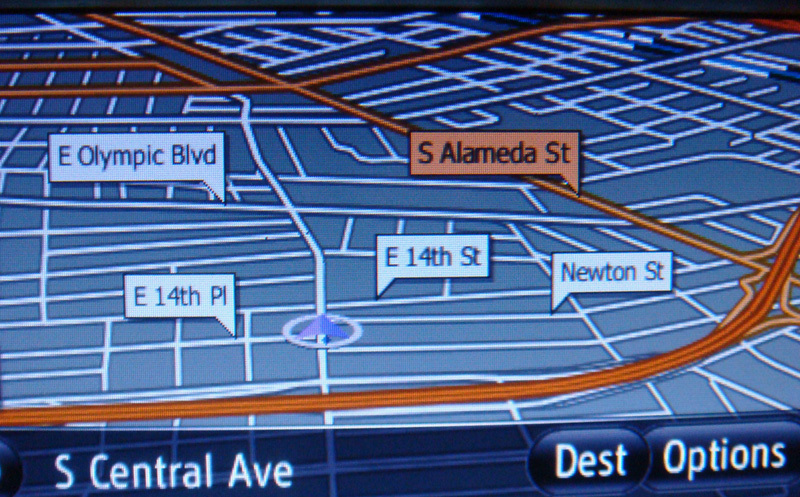 The navigation system will automatically ask you if you want to avoid the traffic by using an alternate route. I’ve used to on several occasions to save a bunch of time. The navigation system has 3 views: 2D, 2D north and 3D. The view below is 2D north where the top of the screen is always north. I like this mode because it helps you know which way north is. In regular 2D mode, you have to look at the compass to figure out which way north is. Since my sense of direction is so bad, this is a needed feature for me. You can also zoom in or zoom out on the map by touching the “+” or “-” buttons. Sorry, no pinching like on your iPad. 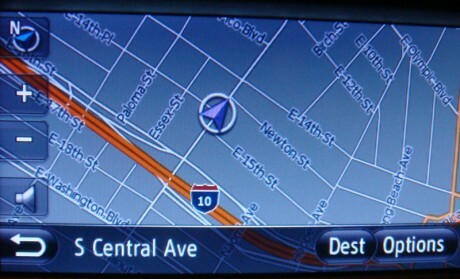 The picture below shows the navigation in 3D mode. The streets are shown in larger font and easier to read but I still like the 2D mode personally. What I really like is the turn by turn directions that are setup perfectly to tell you to turn at the right time. Yes, the voice does sound like a fem-bot but so does all the other navigation systems. Personally, I kind of like taking direction from a fem-bot. 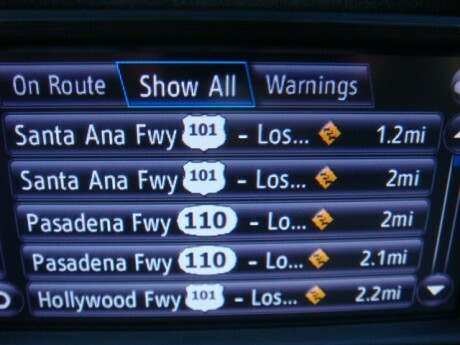 The GPS is rock solid as compared to my on and off GPS in my cell phone. Some things to note are that you can use your voice to control the system. However, I found it to be frustrating sometimes and touching the button is usually quicker. But, if the vehicle is moving, the system will refuse to let you make your selection using buttons, for safety reasons. You will have to come to a complete stop before the on screen keyboard will return. Let’s face facts. If texting while driving is dangerous and there are laws against it, it’s probably not safe to be checking your stocks or finding cheap gas prices while driving. 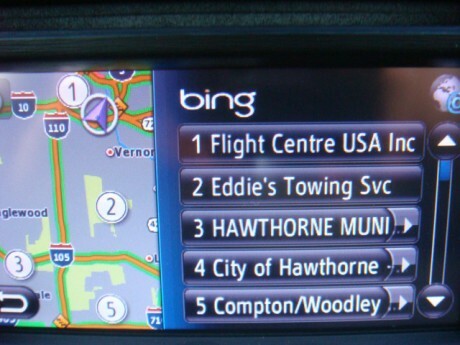 Commercials often show the driver talking to the car to get directions but it doesn’t show all the steps that are required to get to that point. 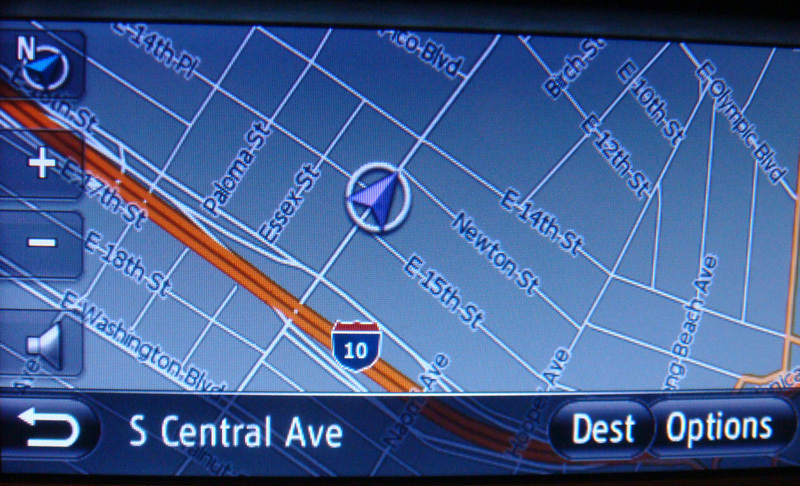 I love having the navigation system on all the time so that I know where I am at all times. All the other Entune fluff that comes with it might be fun for the passenger, but frankly, it’s too dangerous for the driver to be playing with while driving. All in all, the user interface needs to be upgraded, and they should contact the people that made Siri for the voice recognition. 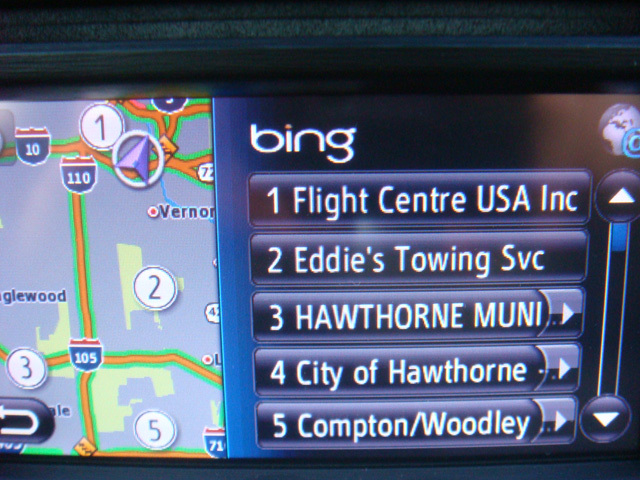 The navigation system is solid but I wasn’t very impressed with Entune. Toyota, please contact me when you have version 2.0 available. Hello, you mentioned a 3D map option in navigation. How did you enable this? I can't seem to find the option. Nice write up. You hit the high points and were frank about the downsides. It's the button in the upper left corner (with the "N") above the "+" button. There are two nav systems, the "Display Audio with Navigation" and the "Premium HDD Navigation." 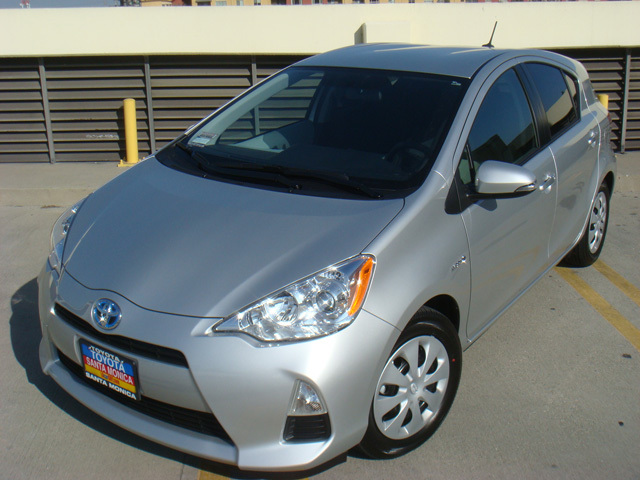 The latter is, obviously, a premium package upgrade to the models 4 and 5 (I'm looking at the Prius specifically; I presume it applies to the Prius C, too). If you do the "upgrade," you LOSE 3D MAPPING! And the one-shot voice entry. That is, with the basic system, you can just say "200 Main Street, Mytown, New York" and it'll find it. With the Premium system, you have to say "New York" then wait for the system to repeat that back, press the Speak button again, say "Mytown" then wait again, press Speak, say "Main Street" and again wait, press Speak and say "200." I would definitely not buy the Entune again. It doesn't work with my Android Phone and the Navigation seems like it is 3 years old. So I wasted a lot of money. 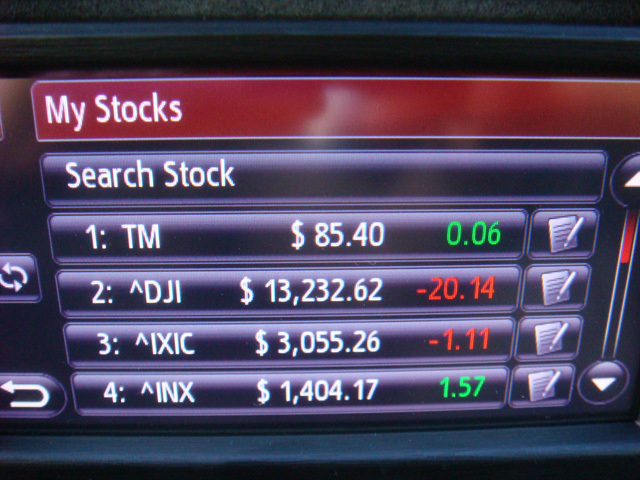 Next time I will buy an aftermarket radio and a separate navigation. I agree with you 100% on that strategy. I will do the same. ps. map update for Toyata system was quoted by dealer at $300!!!! Garmin/Kenwood updates are $70 and come out annually (but I normally only update every couple of years). Also, the Garmin/Kenwood has a traffic system that uses the road sensors for a one-time $50 charge. I’ve noticed some similar problems with the navigation. I was near Fry’s in Industry recently and it didn’t even have the street I was on at all. I use my smartphone to navigate because that uses the latest updated map information via online data.